Pig destroyer is great. i didn't know that SPs could handle those fast tempos accurately. i was sure that agoraphobic nosebleed would be rockin an mpc. Last edited by elhuana on Wed Feb 10, 2010 8:58 am, edited 1 time in total. Last edited by IIIII on Wed Feb 10, 2010 5:28 am, edited 1 time in total. c'mon people! edit yr posts so we know who these cats are! 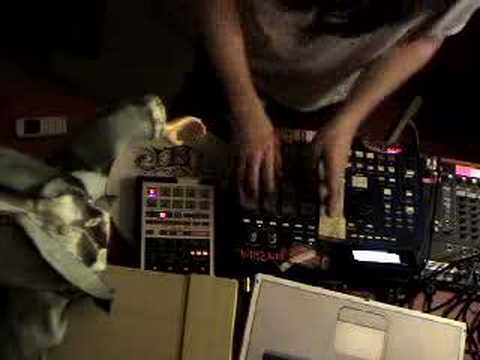 i've seen animal collective rockin' two sp-404s, and I've seen fourtet using one with a laptop (looked for images, couldn't find any. so sad). Took this at the inauguration last year. "The end of a journey may be the beginning of a greater adventure!" This guy over here has been known to perpetrate some SP crimes. Location: live from spectrum, Gloucester. bill bailey (comedian/musician) was rocking a 404 on his last dvd, used it for triggering loops then played keys on top. Looks like the 202 is the secret to his power. he died for our copyrighting sins!!! that is the funniest fuggin thing i have read on here. unreal!